A few days ago while on my midday walk with the dogs, when I was on the 1700 block of 15th Street South, I saw what looked like an albino robin. Can’t be, I thought to myself. I took a double take and watched the bird and several robins fly down from the branch he was on toward the driveway of a nearby house. Must be a white dove, I said out loud. Even if that were the case, it would have been pretty unusual in this area. I’ve never seen an all-white dove in the Dakotas or Minnesota; they’re all grey. When the bird lit on the ground with his robin buddies, about 20 yards from me, I got a better look. Nope, didn’t look like a dove. Definitely shaped like a robin. Plus, he was flocking with a bunch of robins…. I watched until the birds flew away, then grabbed my cell phone. I called the NDSU Extension Service, which referred me to NDSU Animal Sciences, which referred me to NDSU Zoology. After the secretary tried a few zoologists in the department with no luck, I finally would up with Mark E. Clark, associate professor of biological sciences. When he asked what he could help me with, I responded, “Well, I might be crazy, but I think I just saw an albino robin.” He chuckled, assured me I wasn’t crazy, then started telling me about the bird I’d just seen. 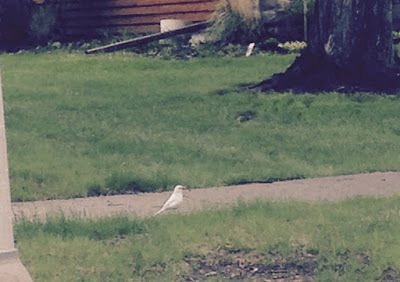 Turns out this white robin has been spotted every year in Fargo-Moorhead since 2014, mostly on the north end of town near Trollwood Golf Course. The NDSU Zoology Dept. has been tracking where the bird nests each year, which has always been in the same general area of north Fargo. Mark was great to talk to and gave me a lot of information. First, he explained that he and his colleagues are calling the robin “leucistic” rather than “albino” because no one has actually held the bird in their hand to determine if it’s an actual albino (see distinction below). Mark said they’re fairly confident the bird is a “he” because of behaviors they’ve noted. He also told me about where the bird has been nesting and that the sighting in south Fargo meant he was on the move, maybe getting ready for the fall migration. Finally, he told me many people have spotted the leucistic robin many times since it was first seen in the community in 2014. Sorry for the delay responding – start of the semester is always hectic. It was nice chatting with you, and thank you for the report on the robin. I’m attaching a map* showing the approximate nesting territory (as a yellow box) from 2014. We didn’t manage to locate the nest in 2015, but we think it was maybe on the next street south from the 2014 location. I’m also attaching a jpg of the bird, which one of the students made. Probably the best link for bird location reports is handled by the Cornell Lab of Ornithology, and is known as eBird. The URL is http://ebird.org/content/ebird/. If you create an account you’ll be able to submit sightings (anyone can view sightings reported by others). I’ll contact a couple people from Audubon to find out about the bird report hotline, and pass that along to you. Pretty cool, indeed. Thank you, Associate Professor Clark, for using some of your land-grant time for community service with me, and thank you, white robin, for being here. Even though you aren’t a dove, Rob, you still gave me a feeling of peace, joy and oneness for just a little while. * I haven’t included the map here to protect the homeowners in the leucitic robin’s nesting area. Don’t want a bunch of rabid bird watchers crashing the neighborhood. Next Next post: Carson Wentz – “The Dakota Kid”?